Postpartum depression and anxiety are much more common than we realize. It’s possible to have the symptoms and not even know it. Here’s what you need to know about postpartum depression and anxiety, and 20 things you can do to start feeling better now. Having a baby brings up many powerful emotions at once. And lots of new pressures. You can feel joyful that your baby is finally here, yet find it challenging, exhausting, and lonely at the same time. Adjusting to your new life as a mom is also a huge transition: in addition to recovering from childbirth, you’re caring for your baby around the clock. And it often can feel like an entire day passes without you getting much “done”. The newborn phase is a beautiful and important time, but in many ways is also difficult. It’s a short period in time where your baby’s needs trump everything. Having a baby changes your routines, and mixes up the dynamic in your home and your relationship in many beautiful and challenging ways. There’s a lot of pressure to do everything picture perfect (or social media perfect…). There’s a lot of change happening all at once, combined with disrupted sleep and new responsibilities. As much of a blessing as it is, being a new mom is hard. So it should be no surprise that over 80% of new moms experience negative thoughts after giving birth. We’ve all heard of the baby blues, and most moms experience this temporary wave of emotion. But if the feelings of emptiness or despair linger beyond a couple of weeks, postpartum depression is to blame. And if constant thoughts of worry are occurring, postpartum anxiety may be at play. If you are concerned about your safety or the safety of your baby, or if you have thoughts about harming yourself or your baby, please call 911 or the National Suicide Prevention Hotline at 1-800-273-TALK (8255). Why Aren’t People Talking About PPD/PPA? What is Postpartum Anxiety (PPA)? What Causes Postpartum Depression and Anxiety? My first pregnancy was incredible. I felt amazing and my friends and family were very involved and helpful. I got tons of advice on what baby products to buy and even had two baby showers. It was a beautiful way to celebrate my pregnancy and prepare for the baby. But despite all the advice and support I received, I don’t feel like I was briefed on what labor would be like or what to expect after the baby is born. Or about the possibility of experiencing postpartum depression and anxiety. People really only shared the positives with me. And though I did a lot of reading, took a childbirth class, and watched a couple of documentaries, I didn’t really understand how life would change after the baby was born. This left me with the impression that postpartum depression was something I didn’t need to worry about. It felt like a rare and unlikely condition that “probably wouldn’t happen to me”. So I didn’t really give it much thought. My birth experience was challenging. I was medically induced and had intense labor with rapid contractions and second-degree tearing. I was so proud of myself that I birthed without an epidural (that was very important to me) but I still had received two or three rounds of Cervidil to start labor. Additionally, I received the TDAP shot after giving birth. My body needed to recover from and detox all of that medication. I felt numb and tingly for a few days after giving birth. Still, I was overjoyed that I was finally holding my sweet baby in my arms. But I quickly became overwhelmed with taking care of him. My son wasn’t a good sleeper and it turned out that he had reflux. I had to cut several foods from my diet, which was difficult for me at the time. Add to that the fact that we didn’t have family around to help us with the baby, and the stress and pressure I felt as a new mom to know what I was doing and to handle my new responsibilities. It was a big adjustment for me. I was very weepy for the first couple of weeks. Everything made me cry. (This didn’t happen after my second baby was born, by the way.) I found myself in “survival mode” for a long time and dreaded nighttime because of how frequently my son would wake up. I loved my baby, but I was drained and no longer felt like myself. I was frustrated, tired, and angry. I was overly anxious about every little thing, especially my son’s health and safety. I was obsessive about my baby’s naps and felt like my status as a mother was based on whether he slept well or not. Truthfully, I felt like I was drowning a lot of the time but assumed that was normal. So I powered through. Maybe I wasn’t well prepared and just didn’t know what to expect; maybe I was naive. Maybe it was the sleep deprivation. Probably a combination of it all. Guilt. Fear. Expectations. Loneliness. Diet. Exhaustion. All of this threw my anxiety into overdrive and made me feel like I was stuck in a deep pit. But why didn’t I have a clue that it would be this hard? How many women do you know that openly admit to having postpartum depression? Aside from some celebrities, I don’t know a single one personally. It’s even hard for me to admit it; reading what I wrote above about my experience with PPD is painful for me to do. But the truth is that postpartum depression is much more common than a lot of people realize: 1 in 8 mothers experience PPD. And it’s estimated to be higher than that, but many women go undiagnosed and untreated. That means many more moms are experiencing it than we realize. It’s so easy to assume that everyone else has it together while we struggle, but that isn’t very likely. Though we see the happy moments pictured on social media and smiles at Gymboree, many new moms are feeling lonely or overwhelmed, and many are struggling with PPD. But people aren’t being open about it. It’s hard to admit that you’re struggling – especially if you’re a mom. There’s a lot of shame and guilt associated with admitting that you aren’t “perfect”. But having a baby, recovering from childbirth, and caring for a baby can all be very taxing on anyone. We’re all in a similar boat. And I think that’s where we can be more helpful to one another. If we aren’t being honest and admitting that it can be hard after the baby is born, or that it can take time to get the hang of things, aren’t we setting one another up for disappointment? I know I’ve always been unsure about “warning” other moms about what to expect. Maybe they won’t have the same kind of experience I did. Maybe by telling them what I went through, I would be tainting their experience. Aside from making sure to tell moms to enjoy their pregnancy, I’ve never really explained how difficult it can be to care for a baby. So I’m trying to change that. I want to be more open about postpartum depression and anxiety because they are way more common than we all realize. And I hope to empower other moms to recognize the symptoms of postpartum depression and anxiety in themselves, ask for help, and feel safe in their experiences. And I also want to empower you with ways to reduce your risk of PPD/PPA, and to support your body and mind if you are experiencing it. Postpartum depression is a form of clinical depression that occurs after childbirth. It typically involves feelings of sadness, guilt, and hopelessness or manifests as anger and rage. It normally starts when your baby is just a couple of weeks old but it can happen any time during your baby’s first year of life. Postpartum depression isn’t limited to first-time moms; you can experience it even if you didn’t have it with your first-born. It comes in many forms and a wide range of experiences; it can include things like rage, disconnect from the baby, and obsessive anxiety. Many moms feel a sense of dread and a feeling of doom. For others, the effects are more physical. They feel drained, fatigued, and have a difficult time eating. Many moms feel inadequate and don’t feel like bonding or cuddling with their little one and this, in turn, makes them feel even worse. For others, PPD manifests itself in rage – this includes anger at how life has changed so dramatically, the new and burdensome expectations of caring for a baby, and resentment at having to miss out on so many things in life. A lot of moms with PPD wish they could go back to their pre-baby life. For others, guilt is the defining feature of their PPD experience. They feel guilty that they don’t love their baby the way they should or that they aren’t taking care of them the way they should. Baby Blues: This is the milder and less alarming version of postpartum depression. The baby blues usually begins 3-10 days after the baby is born and typically lasts only two to three weeks. Common symptoms include sadness, fatigue, crying, anxiety, and moodiness. The good news is that this usually goes away on its own. Postpartum psychosis: Sometimes referred to as postpartum psychotic depression, this is a condition that is relatively rare and affects approximately 1 in every 1000 women. It may be preceded by things like memory problems, irritability, and insomnia. The particular features that distinguish this kind of depression are the presence of hallucinations (hearing or seeing things that are not real), delusions (having false beliefs about reality), and intrusive thoughts. Postpartum Post-Traumatic Stress Disorder (PPTSD): Affecting women who experienced trauma during childbirth or right after the baby was born, PPTSD happens to up to 5% of women. Symptoms can include avoiding anything that triggers memories of the event, feeling listless and detached from life, and having nightmares or flashbacks of the trauma. Many people confuse postpartum anxiety with postpartum depression. Although many women have both at the same time, the two are different. Postpartum anxiety is actually more common than postpartum depression. Postpartum anxiety includes incessant worrying; it is a level of stress that makes mothers constantly nervous, jittery, and edgy. This all-consuming tension interferes with their daily life, making it hard to function normally. Postpartum Obsessive Compulsive Disorder (PPOCD): This condition manifests itself in the form of repetitive, hyper-attentive thoughts about the safety, health, and well-being of your baby. PPOCD does not only affect mothers who have given birth but also adoptive parents. Being overprotective of your baby and wanting to care for him in the best possible way is a natural feeling for parents to have; it is when that overprotective drive turns into bizarre thoughts that start preventing your life from functioning normally that it becomes into a problem. 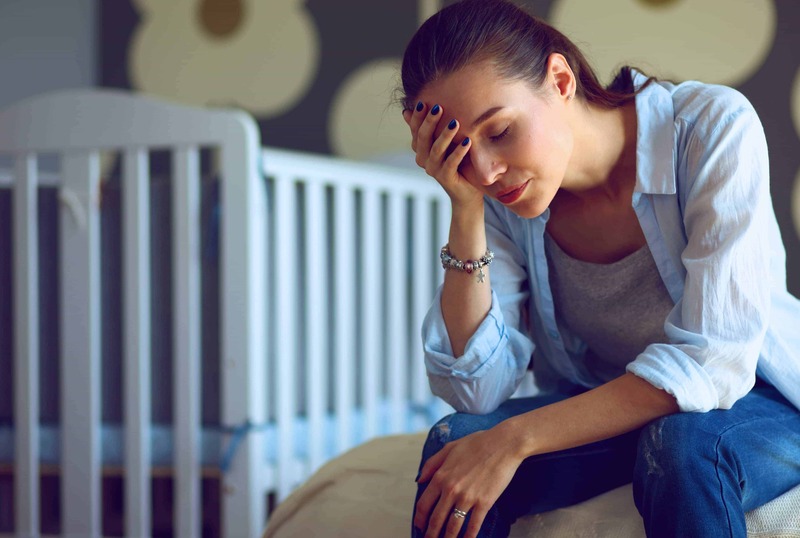 Stress, hormonal changes, internal inflammation, nutritional imbalances, and a history of depression can all contribute to postpartum depression and anxiety. Postpartum depression requires attention and in most cases, treatment. If you think that you are experiencing PPD and/or PPA, here are some steps that you can take. The first three are ones I would get started on ASAP. The remaining suggestions are for lifestyle changes that can be helpful when dealing with postpartum depression and anxiety. These simple adjustments to your lifestyle can be very effective in making you feel like your old self again. 1) See your doctor and run some labs. First and foremost, if you think you’re experiencing symptoms of PPD, call your doctor and schedule an appointment. Being seen by your physician is an important step in helping you to diagnose and address your symptoms. Many doctors may simply treat postpartum depression with antidepressants. Personally, I try to avoid antidepressants and like to take a nutritional and holistic approach to mental health issues. However, you should discuss your plans and preferences with your doctor, and consider filling the prescription because antidepressants can be life-saving and should absolutely be considered for managing severe postpartum depression. Most importantly, though, is to have your blood work done. Ask your doctor to run labs to check for nutritional deficiencies and other health issues such as your thyroid that may be contributing to your symptoms. 2) Take your supplements. After your baby is born, you should be able to continue taking your prenatal vitamins. Anti-inflammatory supplements like fish oil, methyl b-complex, magnesium glycinate or magnesium threonate, and probiotics can also help your body. 3) Talk to a therapist. A licensed marriage and family therapist (MFT) can help you talk through your feelings and give you advice on how to better cope with your daily experiences. If you have never been to therapy, it’s like sitting down with a compassionate friend who is also well-versed in psychology. You get to spend 40 minutes together talking about yourself, and unloading your feelings and worries in strict confidence. They’re there to help you validate your feelings and work through your struggles. Therapy has been so helpful to me and I encourage everyone to do it at least once in their life. If you have health insurance, therapy may be covered and you can search online for therapists near you. Another option is online counseling. This is great if you can’t find a therapist near you that is accepting new clients, or are unable to meet with a therapist in person. I love going in person but it became impossible once my second baby was born. So I turned to online counseling, not knowing what to expect. It has been amazing! I have been using Better Help, the world’s largest online counseling platform. And I am so grateful I found the service and my therapist. I love that it is basically anonymous (though she knows my first name and details about my life and situation) and I can email my therapist anytime. ANYTIME! And, yes she writes back. I also have a 30-minute call with her every week. It’s amazing and I highly recommend the service. It makes it easy for me to continue seeing a therapist and I am so grateful for that. If you don’t want to wait a couple of weeks to get in with a therapist, Better Help is also a great option because you can get connected with a therapist almost immediately. Either way, please speak to someone as soon as possible; talking about your emotions with others can help you feel lighter, calmer, and saner. Postpartum Support International also has a helpful hotline: call (800) 944-4773 or text (503) 894-9453, though it is not an emergency helpline. Call 911 if you are in a desperate situation. 4) Get some sleep. I know, this is ridiculous advice to give a new mom, let alone one that is dealing with PPD. But it’s important and you need to make your sleep a priority. Sleep deprivation is serious and can make your symptoms so much worse. If possible, nap while the baby naps at least once a day. Try to get a decent night’s sleep; 4 hours of continuous sleep at a minimum is what your body needs. Ask your spouse or family members to help out as much as they can so that you can catch up on your rest. If your PPD symptoms are severe, a night nurse or postpartum doula may be helpful and an investment worth making, even on a short-term or part-time basis. 5) Drink tons of water. Your body needs hydration and it’s so easy to forget to drink water when you are caring for young kids. What works for me is to keep one water bottle upstairs in the bedroom and one always on the counter in the kitchen. I also like to start my day with a 16 oz. glass of water with 1/2 a lemon. 6) Take Epsom salt baths. Adding up to 1 cup of Epsom salts to a bath or foot bath is a great way to boost your magnesium levels and aid in relaxation. Alternatively, you could use magnesium oil topically. Try spraying a little on your stomach or the bottom of your feet. 7) Eat nutritious food. The food you eat has a direct impact on your mood and how you feel, so it’s important to eat well during the postpartum period. That goes double if you’re breastfeeding, since your body will need at least 500 extra calories per day. When experiencing PPD, many women lack motivation and have no appetite, so they may start skimping on meals or turn to unhealthy snacks. I know I would sometimes forget to eat or drink water. Try to prioritize healthy eating habits as this will not only affect the quality of your breastmilk but also your mood, overall wellness, and energy levels. 8) Get some fresh air. Going outside – especially in the sunlight – can have a profound effect on your mood. Though this can be difficult with a newborn, it’s often worth the effort to go for a walk or a hike with your little one. Sunlight can have a positive effect on your mood and wellbeing. 9) Include exercise in your daily routine. Research shows that exercise is extremely helpful in treating depression. Start slowly; a 30-minute walk every day can do wonders to your overall physical and mental health. It can feel like it takes forever to leave the house with a newborn, but don’t let that stop you from getting daily activity, even just for a few minutes. 10) Join a support group. Joining a Mommy & Me class led by a trained MFT or psychologist can be an excellent way to get the help you need. You will get a chance to meet other moms with kids the same age as yours and form new friendships as well as discuss similar issues/concerns that you may be going through. I loved my Mommy & Me class and how they focused on important topics like baby sleep, bonding, marriage after baby, and self-care. I am still in contact with the families from my Mommy & Me class from over four years ago, and we all attend each other’s birthday parties and special events. I highly recommend joining a class like this! It’s one of the best things you can do for yourself – especially after having your first baby. 11) Create a routine or schedule. I am a fan of having a routine. Even if your baby is still a newborn, you can benefit from having a daily schedule. It helps to jot down the times your baby tends to nap, as well as any other routine responsibilities you have (e.g. feeding the cat or taking the dog for a walk) and what you want to accomplish each day. Plan for meals, baby’s bedtime routine, and your key responsibilities, too. Having a schedule can help bring intention back into your day, even if you don’t necessarily follow it every day. 12) Let the housework wait. Taking care of a newborn is hard work. Be sure to reset your expectations (and your partner’s) about housework. And be easy on yourself – you probably can’t keep the house as tidy as it was before your baby was born. Many days you will feel like nothing gets done, and that’s OK. Your baby needs you and you are learning the ropes as you go along. Make sure that you and your baby are the top priority during the newborn stage; dirty dishes and laundry will have to wait. If possible, hire a housekeeper, even for just a couple of visits; if that isn’t an option then ask your spouse, family, or even close friends to help out (especially if they’re already visiting). 13) Let go of expectations. So much of our stress comes from the expectations we place on ourselves. It’s easy to feel guilty if the house isn’t spotless or we’re late doing baby milestone pictures. Focus on what matters and make sure you’re not sacrificing your own basic needs to do things. Some things can either wait or get deprioritized. 14) Make self-care a priority. Making your physical, spiritual, and emotional health a top priority is one of the best things you can do to avoid depression. 15) Prioritize your relationship. Life after a newborn becomes so busy that we end up neglecting our relationship with our spouse or partner. The consequence is that there is growing frustration and resentment on both sides. Even spending 15 minutes a day connecting or watching your favorite TV show together can do wonders in keeping your bond strong. 16) Consider mineral balancing. A hair test mineral analysis (HTMA) can measure the mineral content in your body, as well as toxic metals. Working with an experienced practitioner, you can easily identify which minerals you may be lacking and whether your body is trying to detox heavy metals. I worked with Sassy Holistics and recommend them. 17) Connect with friends – especially mom friends. When suffering from PPD, many women tend to isolate themselves, which can only make the symptoms worse. Call your mom/sister/best friend, make plans, go out, and allow yourself to feel like your old self again. Trust me: spending time with your friends makes you a happier, better mom. It’s also important to cultivate relationships with other moms. They can understand what you’re going through better than anyone. Though it can feel awkward, say hello to other moms you meet at the park, the mall, or even at the doctor’s office. If you feel like you’d want to keep in touch, offer her your contact information and encourage her to text or email you for a playdate. Some of my best friendships started this way! MOMS Club is also a great resource! It’s a support group for moms, with local chapters around the country. Each chapter has a monthly event with a guest speaker on an interesting topic, and they do a lot of playdates and activities together. I have many friends who participate and love it. Search for a MOMS Club near you, or visit their site for more info. 18) Practice meditation. Taking care of your spiritual health is a critical aspect of caring for yourself. Make a daily habit of praying, practicing mindfulness, or simply learning deep breathing exercises. All these methods have an incredible power to soothe and relax the mind, body, and soul. Sometimes I just take a moment to stare into the darkness when my eyes are closed and find this to be relaxing. And similarly, I would encourage you to acknowledge your feelings when they come up. And it’s ok to cry it out sometimes. 19) Try essential oils. I find lavender to be calming, especially when I am stressed or just don’t feel like myself. I dab a little on my wrist and usually feel calmer almost instantly. It also helps me sleep if I apply it right before going to bed. 20) Try acupuncture. Acupuncture is relaxing and can be a great natural treatment for postpartum depression and anxiety. Even just sitting on the acupuncture table for 30 minutes is deeply relaxing. I know that I just gave you a long list of things to do to begin treating postpartum depression anxiety, but I want you to start with items 1-3. After that, the best way to start implementing the rest of the suggestions is to go at a comfortable pace. Take on one new habit at a time and layer in new ones slowly. You’ll gain momentum in no time. While you are working on treating your postpartum depression or anxiety, keep in mind the importance of bonding with your baby. I don’t mention this to make you feel guilty but rather to encourage you to make bonding with your baby a priority, as best you can. Postpartum depression can happen to anyone. I want you to know that if you experience PPD or PPA, you aren’t broken. You will see better days. Good luck mama! Follow the steps listed above to begin to improve your symptoms. And join my Facebook group for support and encouragement along the way. P.S. If you’re stressing about toxins, please know that this is the last thing I want you to do! Stressing about toxins is toxic – we want your body and mind to be strong and healthy so that they can do their job of detoxing any toxins you’re exposed to. Try to breathe and slow down. Prioritizing is what matters most; you’ll never be able to fully avoid exposing yourself or your baby to everything toxic. Choose the items that provide the biggest risk and repeated exposure. And as always, make product and lifestyle choices out of love, not fear. Make choices based on the love you have for yourself and your family rather than “what ifs” and worries. I wish I had access to this when I had my second baby 11 years ago. I had terrible postpartum that last ed about 2 years. I agree with you about toxins. One of the things that made me feel worse at the time was dealing with a 2 year old with eczema. Toxins can play a part in that for some kids and right before my 2nd was born I had started learning about them. So, not only was I postpartum I was also freaking out over toxins. Not a good mix. It’s one of the reasons I started my website about living less toxic because after trying to be Toxic FREE for so long and living in fear I realized I wasn’t doing myself or my family any good. I don’t write so much about the younger years, nursery or pregnancy since I’m in a different stage now. This post will help so many women! Thank you, Stacy! I can’t agree more and had a similar experience because my youngest has eczema. It is very frustrating and sometimes it feels like no one knows anything about it. I’m glad you’ve also channeled your experiences into helping others!